Northwest Navigator Luxury Coaches believes getting from point A to point B should be a stylish experience, filled with exceptional service, exceptional amenities, and exceptional people. 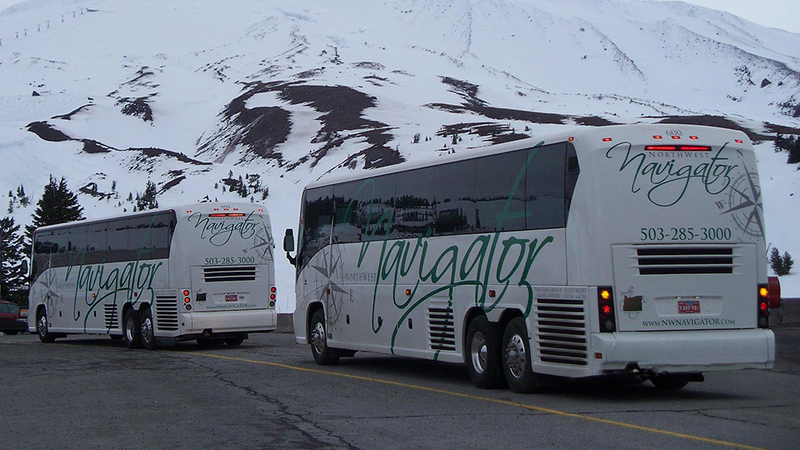 With locations in Bend and Portland, Northwest Navigator has a full fleet of top-of-the-line coaches and buses ready to transport you over the mountains, across town, or anywhere in between in comfort. For business, Northwest Navigator can get your work group to the trade show, meeting, or convention as a team, and on-vehicle amenities like Wi-Fi, flat screens, and individual outlets facilitate productivity for the entire trip. Northwest Navigator loves to have fun, and can be booked for wine country tours, casino runs, customized sightseeing routes, brewery tours, and more. For smaller groups, luxury Mercedes Sprinters carry 12-16 passengers in first class comfort; ideal for bachelor/bachelorette parties, family outings, or getting your group to the airport together and on time. Mini touring coaches and luxury full size motor coaches accommodate 34-56 passengers and offer amenities such as reclining seats, onboard restrooms, and laptop desks. Northwest Navigator dedicated to keeping Oregon and the environment green by running 100% of its fleet on biodiesel, and its newest coach bus uses cutting-edge. clean diesel technology. Wherever your destination may be, make your next trip a memorable journey from beginning to end with Northwest Navigator’s white glove service.